I have a john deere 302-A backhoe. Everything works as it should expect it will not go forward. The reverse works fine. I have replaced the main clutch and replaced the forward clutch pack the old one was burnt up. The hoe is full of oil but still no forward movement I have a manual and parts book for the machine. But it's hard to tell where to check the pressure on the reverser. If anyone can help I would sure appreciate it. I was wondering if you welded up the front clutch pack would it move then and just use it like a regular manual trans just have the reverser for reverse only. I would rule out the thought of welding the forward clutch. 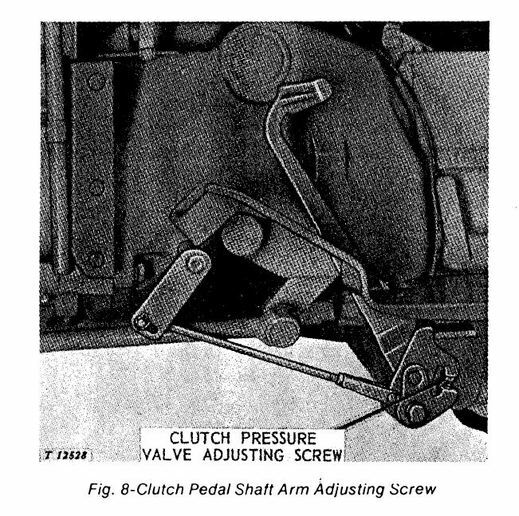 The forward clutch has to disengage when the reverse clutch engages. Welding it would make it always engaged. What do you have for a service/technical manual? If it is a John Deere manual what is the publication number on it? 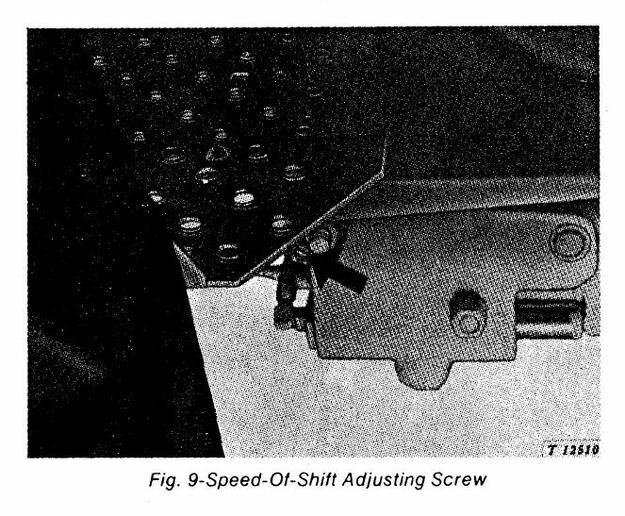 I don't have a 302 manual but have a couple others that show reversers, which by the parts breakdowns look similar, so maybe between them we can locate the test points for you. Were my photos clear enough to help you find the locations to attach gauges for testing? Did you see a reply on the John Deere Forum, from TxJim, about checking for a missing roll pin? I can't say on the 302 loader/hoes, but have been around the 301 tractors, no hoe or loader, a little, and know of several others had. I would pick one of those up if I find one for the right price to mount a forklift on. They were used by multiple steering wheel holders, few operators, and seemed fairly dependable for the treatment they endured. or backhoe. As far as the reverser setup. From looking at the parts catalogs that is what I thought, there are many of the same part numbers in the reverser area, and they overlap in build years. I believe the last photo, fig. 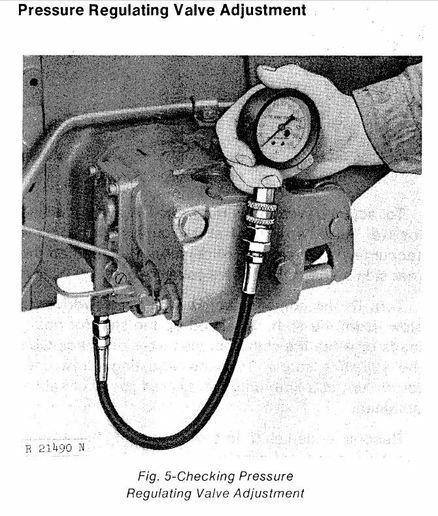 5, is that check, the check of the system pressure regulating valve. Fig. 7 is checking the individual clutch pressures. 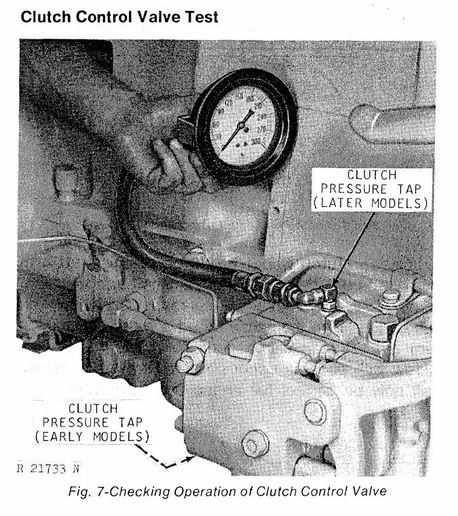 The gauge is shown hooked into the tap for the forward clutch. The reverse clutch tap should be just behind it, towards the rear of the tractor. to come in so I can check the pressure.